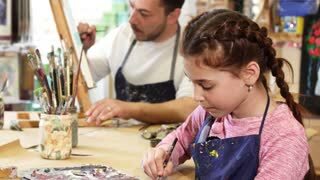 Close up of an attractive bearded male professional artist painter working on an artwork at his studio painting and drawing smiling to the camera happily creativity inspiration job concept. 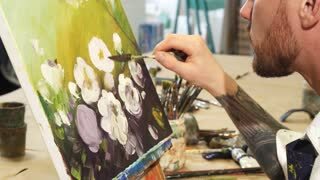 Close up cropped shot of a bearded tattooed male artist painter drawing at his studio working on a painting finishing his artwork profession hobby leisure lfiestyle creativity concept. Selective focus on a bunch of paintbrushes copyspace loving happy couple of painters artists enjoying working on a picture together drawing at the Art Studio love creativity valentines dating. 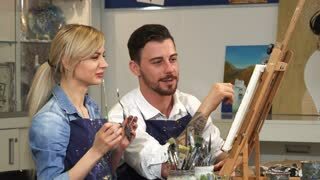 Handsome bearded man helping his beautiful girlfriend painting a picture working on a drawing at the Art Studio togetherness couple dating romance love affection artist creativity teamwork concept. 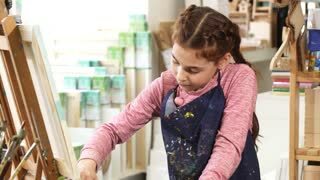 Cropped shot of a cheerful female artist smiling joyfully working on her painting drawing flowers on canvas using oil paint profession creativity inspiration nature artwork hobby.